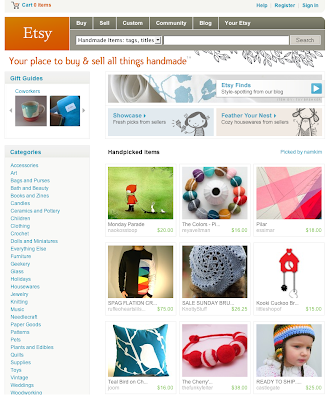 The Funky Felter: A wee bit of front page fame on Etsy yesterday! Yay! A wee bit of front page fame on Etsy yesterday! Yay! I had a little front page fame on Etsy yesterday when my Cherry's Jubilee necklace was featured in a treasury by namkim that made it to Etsy's front page for a few minutes. My celebrity status didn't last long, but it was fun to see. My necklace is on the bottom row in the center. I just wanted to share. Have a great weekend! Fabulous front page! Congrats, and thanks for sharing.